Owners: John, Tami and Kelsie Marick. Assistant Coaches: Dylan Jones, Blake Woosley. Address: 401 SE Roosevelt Ave, Bend, OR 97702. Dimensions: LF- 330', CF- 390', RF- 330'. Signature: View of Cascade Mountain Range. 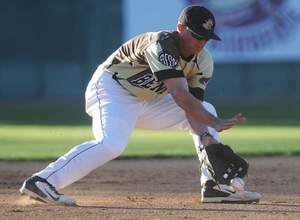 Ellsbury shined with the Bend Elks in 2001 as he got his first taste of college baseball roaming center field at Vince Genna Stadium before going on to star with the Oregon State Beavers. Jacoby signed with the New York Yankees after starring for the Boston Red Sox for seven years and winning a World Series ring in 2013 to go with his 2007 ring as a rookie. The WCL's top prospect as selected by Baseball America led Bend to its first WCL title in 2015 as the future OSU Beaver feasted on his first taste of college pitching while playing stellar defense at shortstop for the Elks. Grenier was a key part of the league's record-breaking offense as the Las Vegas native hit .329 with 3 doubles, 3 homers and 29 RBIs while leading Bend in runs scored with 45 and stolen bases with 11 and earning second-team all-WCL honors. Historic Vince Genna Stadium was built in 1964 and later named after its builder - "Mr. Baseball" himself, Vince Genna. High school, American Legion, and semi-professional teams initially utilized the stadium. 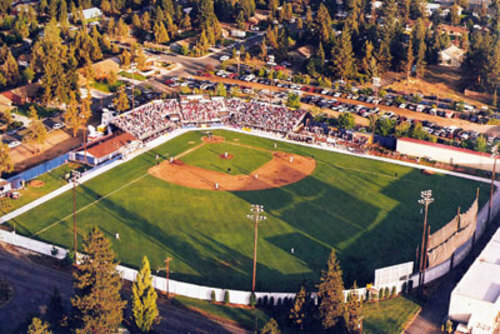 Professional baseball didn't come to Bend until 1970, when the Bend Rainbows, a minor league affiliate of the California Angels, first came to town. Hollywood actor Kurt Russell played second base for the Rainbows in 1971, finishing with a .285 batting average that season. The Northwest League left Bend in 1994 and the Bend Bandits of the independent Western Major League played at the ballpark from 1995-1998. Following the exit of the Bandits in 1998, Vince Genna Stadium lay empty. In 2000, the historic stadium was in jeopardy of being bulldozed. The aptly named Save-Our-Stadium Committee went into action, rallying the community behind their efforts. 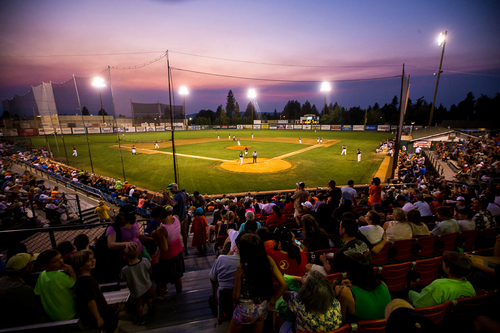 The committee was successful in their quest to keep the ballpark, and Bend Elks signed a multi-year lease with the Bend Parks and Recreation Department to preserve baseball in Bend. The Elks have proudly called Vince Genna Stadium home since the team’s inception in 2000. Bend is located in the foothills of Central Oregon's Cascade Mountains on the edge of a Ponderosa pine forest as it transitions into the high desert plateau. Outdoorsy, yet sophisticated, Bend is the State's hottest destination spot. Oregon's playground is where it's at if you like mountain biking, hiking, rafting, golfing, fishing, climbing, camping, skiing and/or general sightseeing. The area features several resorts and Historic Bend, a must-do locale, with 250 specialty shops, restaurants, brew pubs, art galleries, antique stores, coffee houses and such, coupled with Bohemian flare and historic charm. At an elevation of 3,628 feet, Bend enjoys the predominately dry climate of the Great Basin. Sunny days, low humidity and cool nights are common.